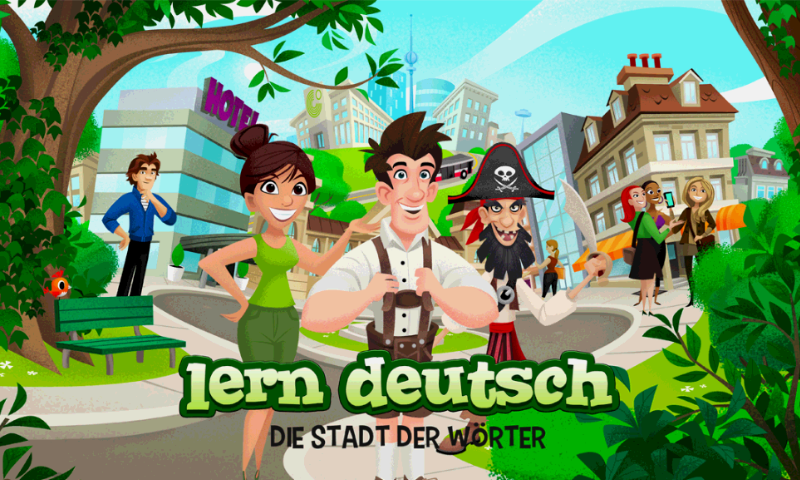 I call Lern Deutsch a vocabulary app, although it’s more of a game than anything else. 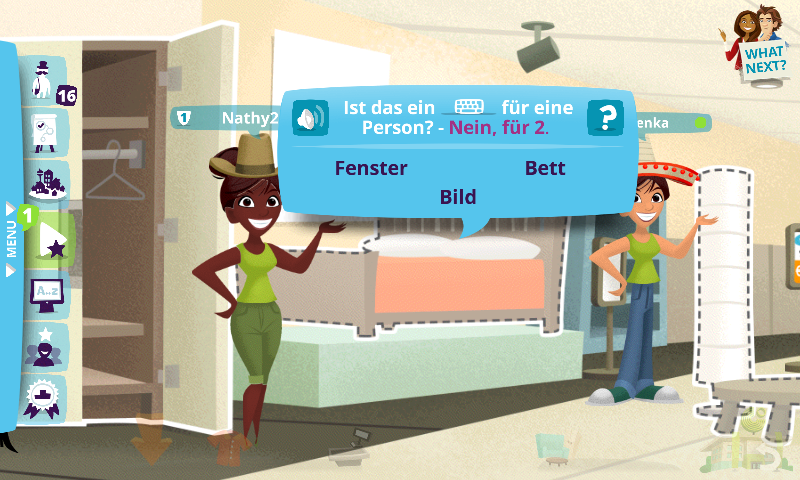 Developed by the Goethe Institute, the free app was probably designed primarily as a marketing tool rather than a serious attempt to develop an educational language app. It’s available for speakers of Arabic, English, Spanish, Italian, French, Italian, Portuguese and Russian. It’s aimed at A1 learners. 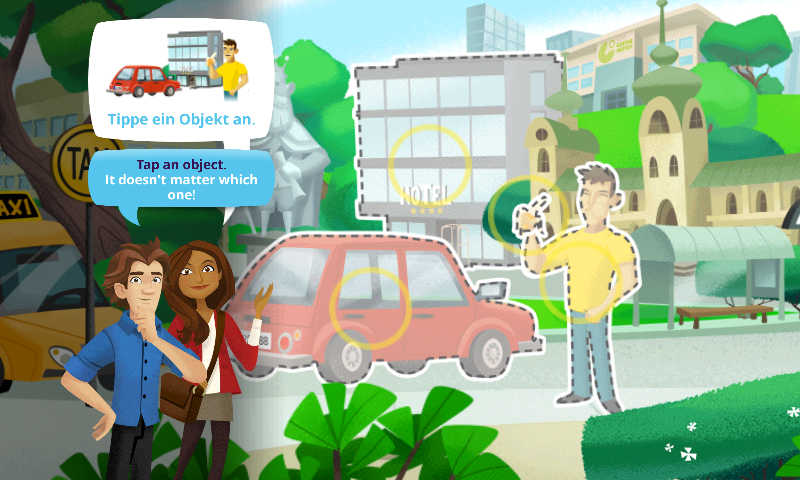 Users of the app create an avatar and roam around a virtual city, learning new vocabulary and practising situational language. 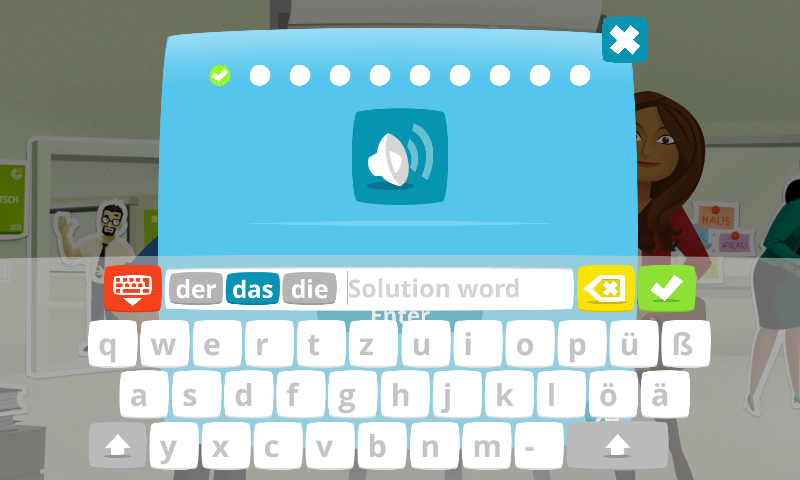 They can interact in language challenges with other players. As they explore, they earn Goethe coins, collect accessories for their avatars and progress up a leader board. The developers have focused their attention on providing variety: engagement and ‘fun’ override other considerations. But how does the app stand up as a language learning tool? Surprisingly, for something developed by the Goethe Institute, it’s less than impressive. The words that you collect as you navigate the virtual city are all nouns (Hotel, Auto, Mann, Banane, etc), but some (e.g. Sehenswurdigkeit) seem out of level. Any app that uses illustrations as the basic means of conveying meaning runs into problems when it moves away from concrete nouns, but a diet of nouns only (as here) is of necessarily limited value. Other parts of speech are introduced via the example sentences, but no help with meaning is provided so when you come across the word for ‘egg’, for example, your example sentence is ‘Ich möchte das Frühstück mit Ei.’ It’s all very well embedding the target vocabulary in example sentences that have a functional value, but example sentences are only of value if they are understandable: the app badly needs a look-up function for the surrounding language. The practice exercises are varied, too, but they also vary in their level of difficulty. It makes sense to do receptive / recognition tasks before productive ones, but there is no evidence that I could see of pedagogical considerations of this kind. Neither does there seem to be any spaced repetition at work: the app is driven by the needs of the game design rather than any learning principles. It’s unclear to me who the app is for. The functional language that is presented is adult: the situations are adult situations (buying a bed, booking a hotel room, ordering a beer). However, the graphic design and the gamification features are juvenile (adding a pirate patch to your avatar, for example). The lack of attention to the business of learning is especially striking in the English of the English language version that I used. The number of examples of dodgy English that I came across do not inspire confidence. Quite alright! You win your first Goethe coin. What sightseeings do you spot in the city center and the train station? Have a picknick in the park. You now have a picnic in the park with the musician. You still search for your teacher. Whom do you meet in the park? What do they work? 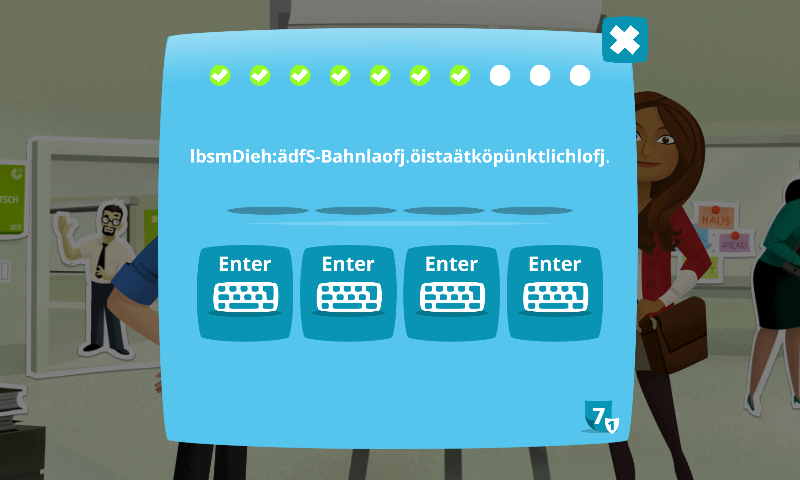 All in all, it’s an interesting example of a gamified approach to language, and other app developers may find ideas here that they could do something with. 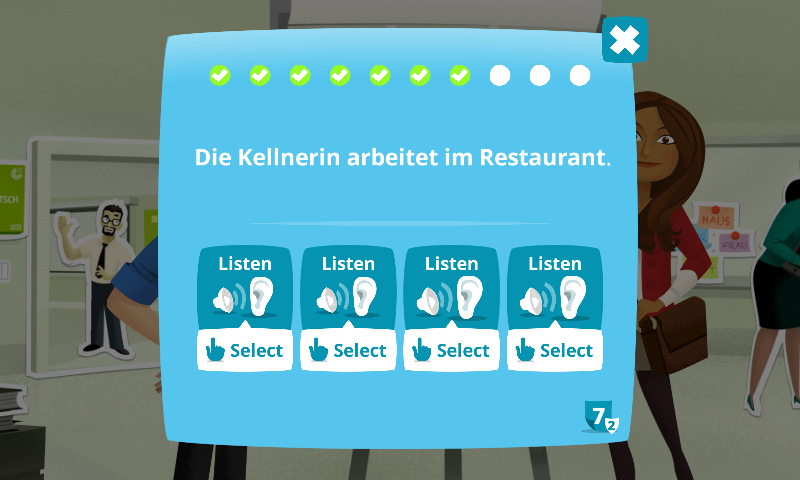 It’s of less interest, though, to anyone who wants to learn a bit of German.